Oakhurst neighbors...here's hoping you were able to spend some time with family and friends over the Christmas holiday. 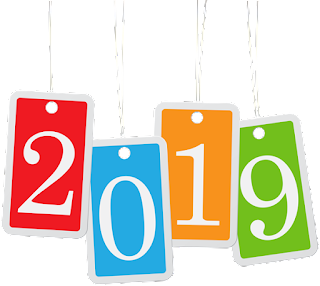 Even as we take some time to reflect on 2018, we at the Oakhurst Neighborhood Association wish all of our neighbors and friends the best in 2019. Your December Oak Leaflet is Here! This month's issue of The Oak Leaflet is now online! 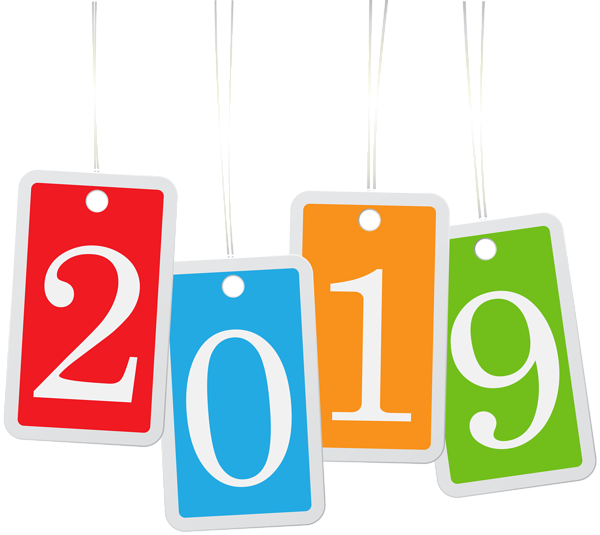 Click on the image below and/or scroll down to the Upcoming Events below to view details on all of the activities and events slated for December. See your December Oak Leaflet and our event calendar for more details! 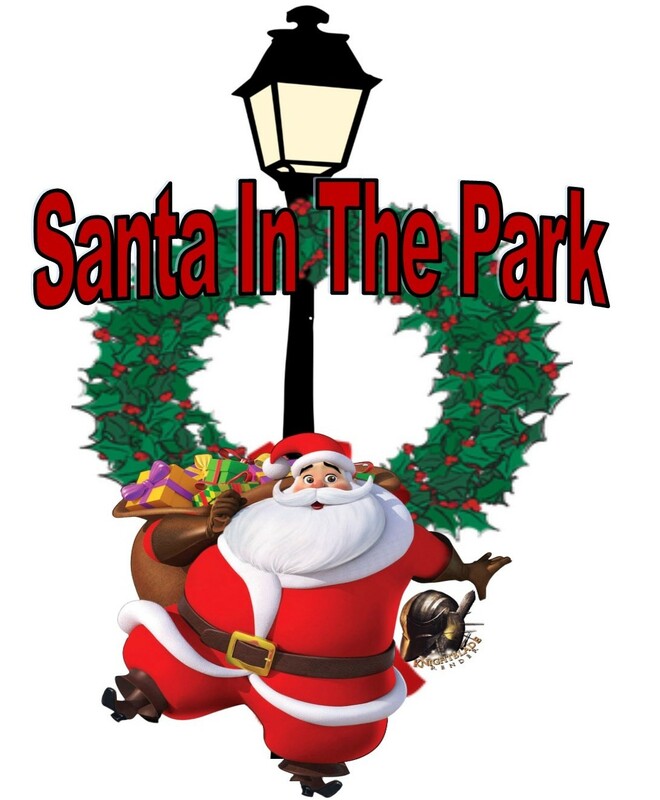 Reminder: ONA Santa in the Park! It’s that time of year! 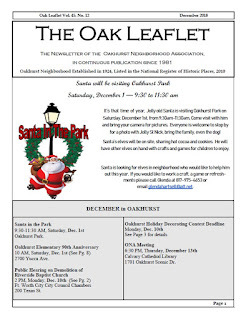 Jolly old Santa is visiting Oakhurst Park on Saturday, 12/1, 9:30-11:30 am. Come visit with him and bring your camera for pictures. Everyone is welcome to stop by for a photo with Jolly St. Nick; bring your family, or even the dog. Santa’s elves will be onsite sharing hot cocoa and cookies. 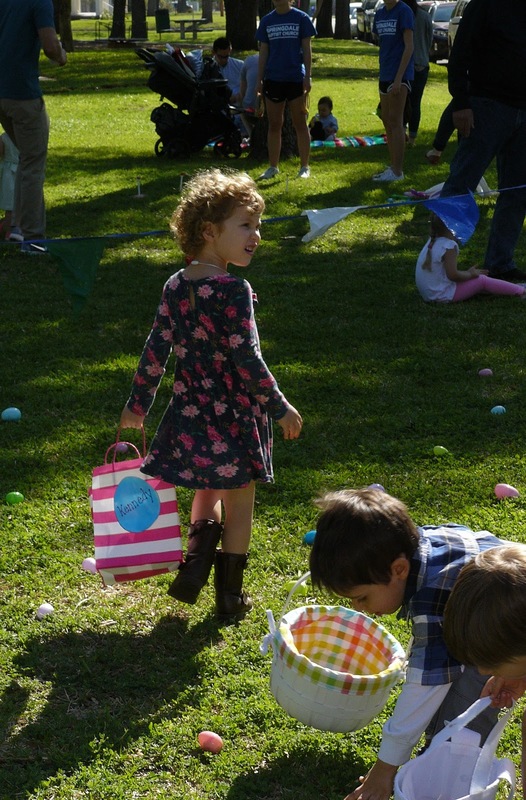 He will have other elves on hand with crafts and games for children to enjoy. Santa is looking for elves in neighborhood who like to help him out this year. If you would like to work a craft, game, serve refreshments, or play Santa, please contact Glenda at 817.975.4653 or glendahartsell@att.net. Both winners received a yard sign and gift certificate from the Tributary Café on Race Street, a contest supporter. The organizers wish to thank those who participated, as well as everyone who voted. The time for voting was shortened and the judging dates pushed back because of the wet weather. The committee looks forward to hosting a contest this Christmas when everyone will be asked to select their favorite holiday decorations. Click on the images above to learn more! The November Oak Leaflet is Here! This month's issue of The Oak Leaflet is now online. October was a big month, and there's plenty to share! Click on the image below to read about the ONA Police and Firefighter Appreciation Dinner and Oakhurst National Night Out. You'll find the Oakhurst Fall Decorating Contest winners and photos from the ONA Halloween in the Park event. Also be sure to check out the activities and events slated for November, including information about the upcoming public hearing regarding the scheduled demolition of Riverside Baptist Church. Vote Now: Oakhurst Halloween and Autumn Display Contest! 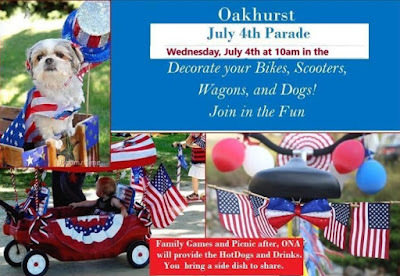 Calling all Oakhurst residents! We are looking for your votes for the "Oakhurst Halloween Spooktacular Yard and Amazing Autumn Display Contest". In spite of the rain, several residents braved the weather and decorated their homes for this contest. Now it’s up to the neighborhood to choose the winners! There are two categories: Best Halloween Decorations and Best Fall Decorations. Voting begins NOW and will end at 9 pm on Friday, Oct. 26. Winners will be announced at the Halloween party in Oakhurst Park on Saturday, Oct. 27. Winners will receive a yard sign and a gift card. 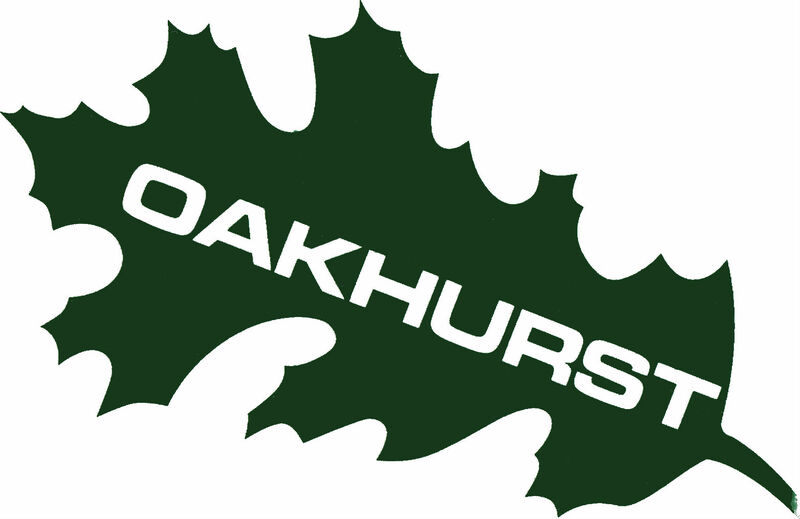 The list of finalists was suggested by the Oakhurst Beautification Committee; send an email to beautification@oakhurstfw.org with any questions. Visit this link to view the nominees for each category and place your votes! 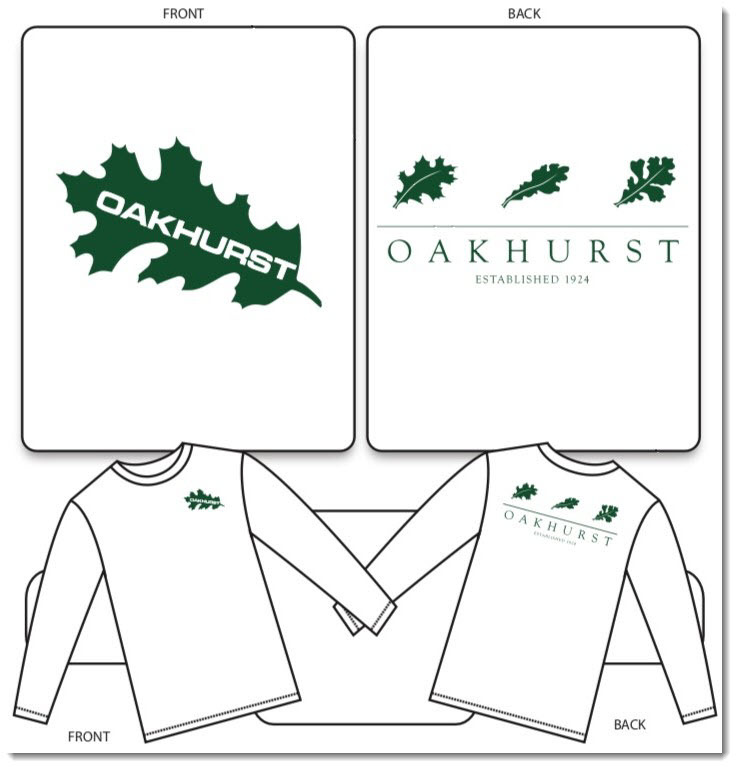 Don’t miss out...get your Oakhurst T-shirt! The ONA Beautification Committee is taking orders for long-sleeved shirts. 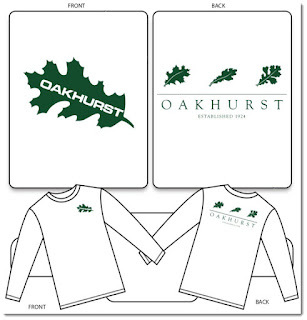 The white T-shirts are $20 (plus sales tax) and have the beautiful Oakhurst logo in green on the front and back. They are available for pre-sale purchase online through the first week of November. Neighbors can also turn in their orders at the Halloween Party in Oakhurst Park set for Saturday, 10/27. Beautification Committee members will be wearing their tees that day. Ordering online will ensure that you get the size and number of shirts you need. A big thank you to the Bylaws Committee for the time, effort, and thought they put into these revisions. The majority of changes relate to the most common request we received from ONA members, having the opportunity to vote for themselves rather than a street representative vote on their behalf. While the Bylaws have always stated all members can vote, the scheduling of meetings and structure of the organization did not provide opportunity for residents to vote. The proposed changes make a way for members to vote on issues more than twice a year. Most other changes relate to the structure of the document itself. Some items were rearranged and vocabulary changed in hopes of clarifying the intention; I wish more of this had been done but the committee could only address so much. More committees were identified and their formation spelled out in hopes of increasing participation and involvement of members. Please review the proposed changes and if you have comments or questions, email the committee at bylaws@oakhurstfw.org. Plan to attend the Oct. 18th meeting at Calvary Academy, 6:30 pm, when the vote on these proposed changes will take place. This is your neighborhood organization and we want need you to be involved so we can continue the work that has made Oakhurst a great place to live. The September ONA meeting was the time scheduled for residents to give input to The Bylaws Review Committee in person; online comments had been accepted for several weeks prior to the meeting. Members of the committee who were present to hear suggestions included Chairmen Jonathon Zimmerman, Robert Brown, Sharon Buse, and Chanin Scanlon. Charles Witt, Ken Cloud, and Ann Kothmann were not able to attend but comments were noted for future discussion by the committee. Approximately 25 residents attended the meeting and about 1/3 of those attending suggested revisions for the bylaws. Allow treasurer to use online banking for some transactions. The proposed bylaws revisions will be posted the 1st week of October to allow residents time to review before the October General Membership meeting on Thursday, October 18th at 6:30 pm. The meeting will be held in the Calvary Academy auditorium. Hope to see you there! Thanks again to the Bylaws Committee who spent many nights meeting and discussing potential revisions! October Oak Leaflet and Upcoming Events! This month's issue of The Oak Leaflet is now online! Click on the image below and/or scroll down to the Upcoming Events below to view details on all of the activities and events slated for October. You'll also find Jan's President's Column, October's Yard of the Month, and more! October is action-packed in Oakhurst! See your October Oak Leaflet and our event calendar for more details! This month's issue of The Oak Leaflet is now online! 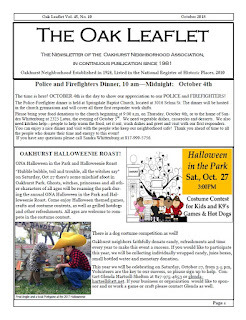 Click on the image below to view details on upcoming activities and events, including the annual ONA Police and Firefighter Appreciation Dinner and ONA Halloweenie Roast. 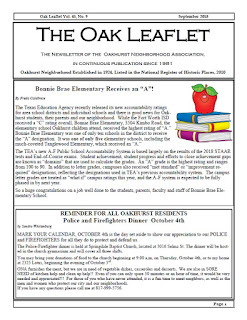 You'll also find an update on Bonnie Brae Elementary by Freda, an article on Ray Jefferson by Libby, reports by various committees, September's Yard of the Month, and more! Save the Date: September ONA Meeting! Make plans now to attend this month's ONA meeting on Thursday, 9/13, at 6:30 pm at the Calvary Christian Academy library. The meeting will comprise an open forum for ONA members to meet with the the Bylaws Committee and give input / offer suggestions on potential revisions to benefit the organization. The committee wants to hear from YOU before proposing changes. Note: The meeting format will be "come and go". Please plan to attend and share your ideas! 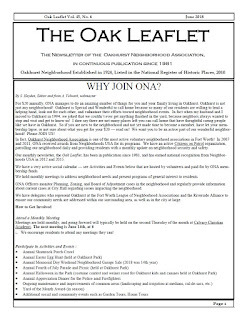 And you may find our current ONA bylaws on our Join ONA page or at this direct link. You may also share your ideas directly with the Bylaws Committee via email. 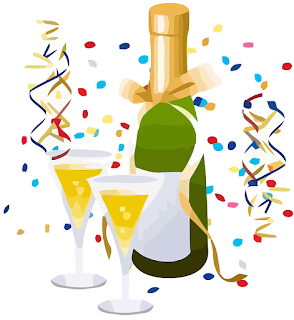 See You at August's ONA Meeting! 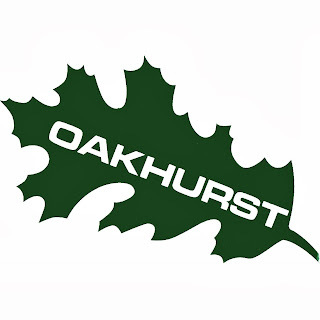 Make plans to attend the August meeting of the Oakhurst Neighborhood Association TOMORROW, August 9. Our guest speaker will be Catherine Huckaby, Community Engagement Manager with the City of Fort Worth. For more details, check out the agenda. August Oak Leaflet Now Online! 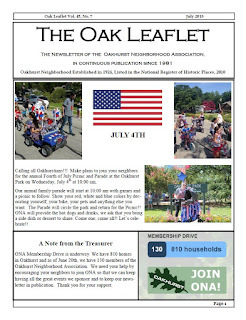 Check out this month's issue of The Oak Leaflet for more details on upcoming activities and events, including a recap of the ONA Fourth of July in Oakhurst Park. You'll also find Jan's President's Column, August's Yard of the Month, reports from the COPs and Welcome committees, and much more. ONA Meeting This Thursday, 7/12! Make plans to attend the July meeting of the Oakhurst Neighborhood Association this Thursday, July 12. Guest speakers will include Debra from the Riverside Library and Aleta from Urban Village Art. For more details, check out the agenda. Read the July Oak Leaflet Today! Man, it's hot out there! Be sure to find a comfortable spot in the A/C to peruse this month's issue of The Oak Leaflet for details on summer happenings. 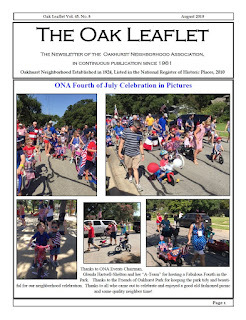 You'll find information on our upcoming Fourth of July Picnic and Parade (and other current events), our ongoing membership drive, reports from our president and committees, July's Yard of the Month, and more! 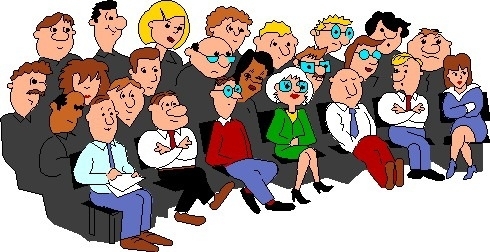 6/14: Join us for our June ONA meeting! Join us this Thursday, 6/14, for our ONA meeting! 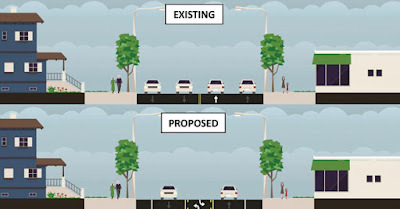 Our agenda will include guest speaker Marisa Conlin, Engineering Manager at the City of Fort Worth Transportation & Public Works department, speaking about the proposed lighting project for Sylvania Avenue. 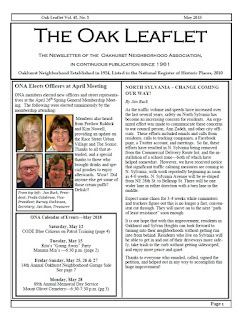 We'll also hear the results of our latest ONA audit, review the minutes of April's General Membership Meeting, and more! Summer is heating up, and so is our ONA membership drive! Check out this month's issue of The Oak Leaflet for more details on upcoming activities and events. You'll also find Jan's President's Column, June's Yard of the Month, and much more. A Tribute to the Queen! A fantastic farewell dinner was held at Mamma Mia in Rita Wilson's honor on Tuesday night. Thank you to everyone that turned out to send Rita off in style. Look for more details in your next Oak Leaflet. Per the City of Fort Worth's website, parts of Oakhurst (and nearby areas) will be seeing some wastewater improvements in the near future. 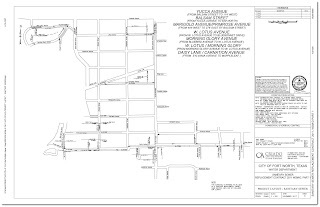 Click on the image below to view the project plans. More Ways to Join ONA! Annual dues of $20.00 are used to support ONA events and maintenance activities. Look for the "Pay Now" button on the Join ONA page, as pictured below. You are now able to pay your ONA dues automatically with an annual subscription! 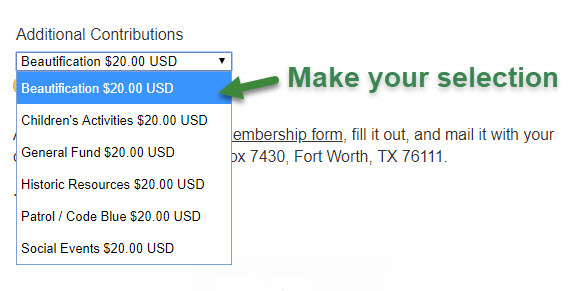 Click the "Subscribe" button on the Join ONA page to set up billing via your preferred payment method, as pictured below. We've added a shopping cart function to enable residents to donate to specific ONA initiatives. In the Additional Contributions section on the Join ONA page, make a selection with the pulldown menu and then click "Add to Cart", as pictured below. Note: To make multiple contributions, click "Continue Shopping" on the PayPal website (before you check out) to return to the Join ONA page and add additional items to your cart! Of course, you may still choose to print a membership form, fill it out, and mail it with your dues to ONA Treasurer, P.O. Box 7430, Fort Worth, TX 76111. Read the May Oak Leaflet...Online Now! ONA has new officers! Check out this month's issue of The Oak Leaflet online for more details. Jan Buck reports on upcoming changes to Sylvania Ave and authors her first President's Column, Phyllis Anglin provides details on an upcoming dinner in honor of Rita Wilson, Libby Willis shares a story about the poet William D. Barney and his ties to Oakhurst, Fran awards May's Yard of the Month, and much more!